The China studies world lost a giant this weekend, as renowned scholar, politician and author Roderick MacFarquhar died Sunday at 88. MacFarquhar’s career spanned geographies (he was born in Lahore, and spent time in Egypt and Jordan) as well as domains (he moved between academia, politics and journalism). His lasting legacy, though, is likely to be the impact he had on students — both ones he taught and ones influenced by his China-related textbooks. In fact, a few of his former students are now noted China scholars. 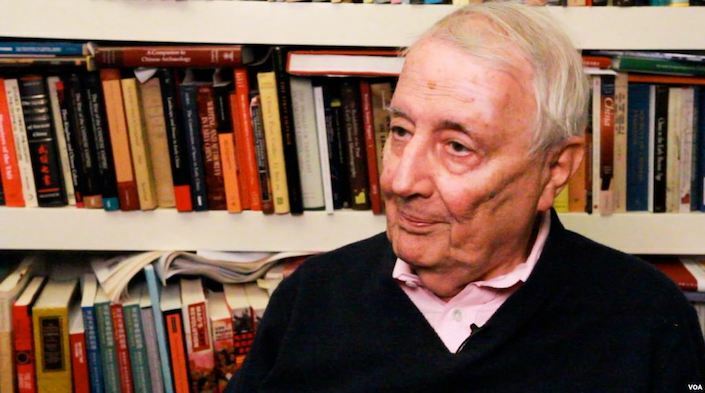 One of the most respected scholars of Chinese politics, Rod MacFarquhar, has died. In his 88 years he served in the British Army, worked as a journalist, was a member of Parliament and was a much-beloved Harvard professor. His course on the Cultural Revolution was legendary. But my most treasured memories of Professor MacFarquhar were more personal: he was a gracious and generous host, seemingly from a bygone era. When Rod raised a glass for a toast, the words he used were heartfelt. He made everyone around him feel special. I was honored to know him. MacFarquhar was indeed a giant in the China field, whose scholarship influenced generations of scholars. A sad day. I worked as an intern for Roderick Macfarquhar in 1981 when he was working on his second book on the Cultural Revolution. I wish I could have taken his course! He was a wonderful man and a China-watcher par excellence. Rod was also a great mentor and trained many students. China-watchers have lost the original great China-watcher, Roderick MacFarquhar. What a giant, truly an inspiration to countless among us. He will be missed. I mourn the loss of Rod MacFarquhar, a brilliant #China scholar (after a storied career as a journalist) & an inspiring teacher+mentor for generations of students. His Cultural Revolution class opened new horizons. When I became a correspondent, he helped me understand China more. For Chinese readers, make sure to check out MacFarquhar’s interview with Chinese publication 政见团队 from a few years back.